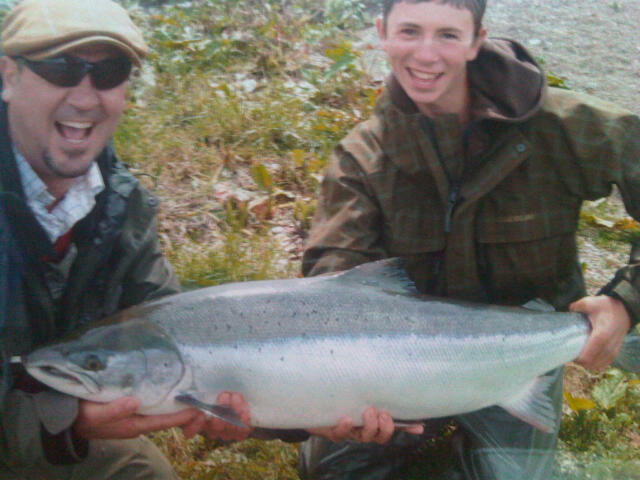 14 year old Frank Cottons 28lb fish caught at Sprouston during this week has to be applauded – being the largest springer recorded on the river for a considerable number of years. The fish was a fraction short of 45″ long and well proportioned in the girth, was netted by Frank’s father who weighed it at 28 lb 5 oz’s on a set of digital scales. Frank had a titanic battle with the fish as it made many downstream runs – it didn’t show on the surface for around 40 minutes – before it was netted some 55 minutes after it was hooked. Although Frank is only a young chap, he is fast becoming a seasoned salmon fisher with a fair number of fish to his name – mainly caught on the fly – and on this occasion the fish took his size 8 Red Ally’s Shrimp. After pictures were taken, in line with the rivers C&R rules, the fish was successfully returned. Well done Frank. See Bill Stanworth’s weekly report for further news about this week. Well done young fella. I’m 52 now, and have been chasing my elusive first Salmon since I was your age. A thousand Trout have fallen to my flies, in scotland, Ireland, Australia and New Zealand, but alas, old Salar still evades me. Good for you Frank.